Advanced Colour City is your one stop solution provider for any types of residential painting services in and around St Ives. We have always managed to exceed our customer expectations by delivering finest quality workmanship and amazing finishing. 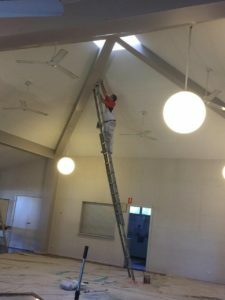 One of the main reasons why homeowners have always been satisfied with our residential house painting services in St Ives is because we pay close attention to minutest details, while working on home interior and exterior walls. Our experienced painters first help you with clearing your household things, so that the paint drops do not fall or spray on them. We prepare the wall or wooden surface by washing off dirt, molds, grease, oil, etc. All the cracks and nail holes on your home interior and exterior walls will be filled with cement to create a level surface for painting. After the paint dries up, our experts will decide if any extra paint coating will be required. Contact us today to book an appointment with our experienced residential exterior home painters in St Ives.